In the first article we introduced the concept of the hybrid approach. It is perhaps the most general case so it has potential to be reused to fit many circumstances. In this article we’ll look at here the savings come from and when. Going right back to basics, a compelling business case is one where you can demonstrate that the costs of making a change are smaller than the benefits that will be achieved and that the time to get a return on investment (ROI) – the payback period – is within an acceptable time scale. So to build a compelling business case for electronic invoicing we need to understand and quantify, in cash terms, the cost of implementation and when those costs will be incurred and we need to understand and quantify, again, in cash terms, the benefits and when they will materialize. It sound very basic but many business cases fall down because the benefits are never quantified properly. Benefits like “fewer errors”, “more right first time matches” and “greater efficiency” are no use unless you can express these benefits in terms of money saved. Identifying savings is notoriously difficult for purchase-to-pay projects. Whether it’s e-invoicing or e-procurement, the same problem arises. If you can reduce the number of heads in your organization it is easy to measure the savings but if you only lose fingers and toes by delivering marginal efficiencies, where are the savings? But there is another issue. What methodology will you use? 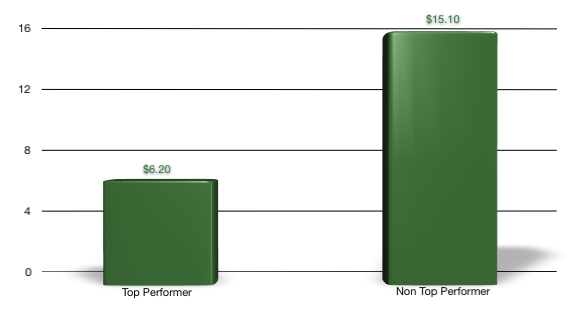 How exact do you want to be and how will you convince your stakeholders that you’ve estimated the savings correctly? The reality is that home grown business cases are rarely believable and they are more often than not reverse engineered and based on guess work. So you need a way of identifying and quantifying savings – in cash terms – that has some authority and will be taken seriously when presented. This is where benchmarks come in. The great strength of benchmarking is their authority. Benchmarks give you a means of knowing what benefits have actually been delivered in the real world. And they allow you to build your business case quickly. It is not necessary to perform detailed business process redesign to estimate savings. You can just go straight to the back of the book and look at the answers. The benchmarks selected for this example are fairly simple. They won’t fit every set of circumstances and alternative benchmarks may be more appropriate. So select the benchmarks you use carefully to ensure they reflect the business circumstance appropriately. This benchmark works well for the general case. It uses a kind of simplistic maturity curve that goes from paper process to electronic invoice via scanning and work flow and OCR. Don’t waste time trying to understand how much it costs to process an invoice in your organization. Start with an assumption that you are average. (Yes of course your organization is not average and every organization is unique but leave that to one side for the time being.) Now, decide where on the maturity curve you are. In the business case that we are building in this example, our starting point is scanning and work flow. 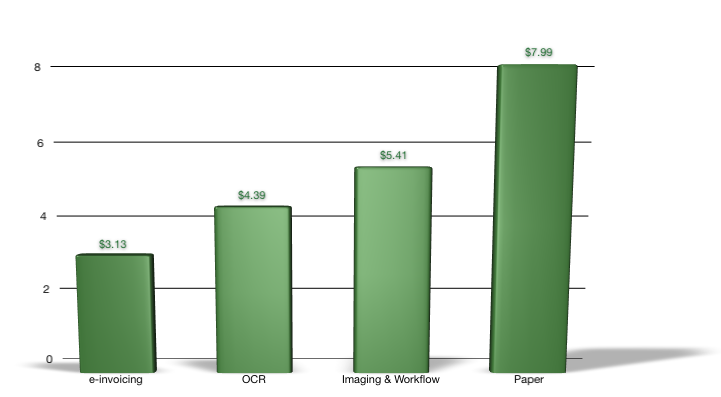 If we move to OCR we will save $1.02 per invoice and if we move to e-invoicing, we’ll save $2.28. The savings indicated by these two benchmarks give an approximate idea ofyour potential savings taken from two difference perspectives. In most cases they should give a roughly similar result. They won’t match exactly but they should, within an order of magnitude, agree. You could stop here but there’s a key element missing: the timing of the benefits. The hybrid model is designed to get to 100% electronic invoicing as quickly as possible – first by implementing true e-invoicing with the easy supplier targets and in parallel, moving to intelligent data capture for the rest. Over time, more suppliers can be encouraged to move away from paper/pdf to e-invoicing. The speed at which the project moves is directly related to that amount of resource committed to it and there is no hard and fast rule as to how quickly 100% (or near to it) can be achieved. In this example we estimate a 2 year period over which we will be actively on-boarding suppliers to give an adoption plan. 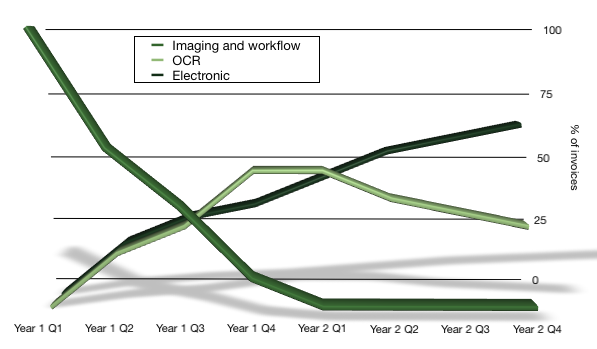 We start with 100% imaging and workflow invoices, (the current invoice model), and over time the % of electronic invoices increase. The OCR invoices increases initially but in the longer term diminishes as supplier move to e-invoicing.